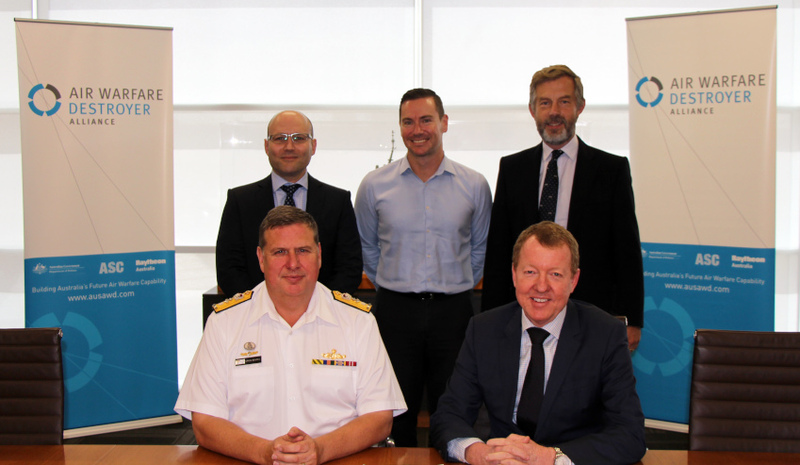 An official signing ceremony was held on 27 March 2017 in Adelaide, attended by AWD Program Manager, CDRE Craig Bourke and Alliance General Manager, Paul Evans. The Air Warfare Destroyer (AWD) Alliance has marked a momentous first, with the Commonwealth accepting the Hobart Class Command Team Trainer at HMAS Watson in Sydney. The acceptance signifies the first delivery of an entire system for the AWD program. This shore-based support system has been in development for nearly a decade and the AWD Alliance said it will enable the Royal Australian Navy to train their future crew members on the combat system prior to operational deployment on the destroyers. "We have transitioned from the theoretical architect and design phase to the actual application of this technology, further establishing industry’s role as a fundamental input into capability for Defence," AWD Alliance general manager Paul Evans said. "The delivery of the Hobart Class Command Team Trainer is the first in a series of capabilities that we are providing to Defence in the near-term, including delivery of the first Air Warfare Destroyer, Hobart, to the Commonwealth later this year." Developed by a Raytheon Australia-led team within the Alliance, the Hobart Class Command Team Trainer system is a significant improvement over existing Command Team trainers currently in service with the Royal Australian Navy according to the AWD Alliance. By recreating the ship’s Command Information Centre using some of the very same software and hardware that will operate onboard the AWD’s, including the Aegis Weapon System software, the system will provide the RAN with the opportunity to educate its personnel in true-to-life training scenarios. The simulation capability of the system allows instructors to dynamically change the scenario on the fly by inserting enemy fighters or ships relevant to the training situation. It also allows instructors to pretend to be friendly or enemy ships and interact in the scenario independently – hence creating a real world feel to the training. The creation of accurate simulated scenarios also includes the ability to produce realistic visuals of the natural environment, such as sea state and all weather conditions. This complete simulated environment built around AWD’s unique combat system will allow the future AWD Command Team to train more effectively to fight and win at sea. The alliance said the Hobart Class Command Team Trainer brings to life the Navy’s concept for a ‘Ship Zero’ capability, which is aimed at maximising the effectiveness of training ashore to minimise training in ships at sea – thereby increasing the availability of the Navy’s fleet for operations. AWD program manager Commodore Craig Bourke also commented on the significance of this capability for the RAN. "The introduction of the Air Warfare Destroyers and the Australianised Aegis combat system into the RAN later this year will provide a significant surface combatant capability for the RAN," said CDRE Bourke. "The Hobart Class Command Team Trainer system is one of several facilities providing RAN personnel with the training necessary to realise the full capability of the new Hobart Class Air Warfare Destroyers." The AWD Alliance is responsible for delivering three Hobart Class AWDs and their support systems to Defence. The alliance is made up of shipbuilder ASC, mission systems integrator Raytheon Australia and the government’s Capability Acquisition and Sustainment Group, and supported by shipbuilder manager Navantia. Frontline Manufacturing achieves ISO certification... - 7 hours ago.